Plans to build 100 more homes on a Gloucestershire estate have been deferred after concerns they might be prone to flooding. Protesters gathered outside Tewkesbury Borough Council offices on Tuesday as local politicians met to discuss the scheme for the Wheatpieces estate. The town's Conservative MP Laurence Robertson said a 1901 Ordnance Survey map showed it to be on a flood plain. The developer has now been asked to review the scheme's drainage system. 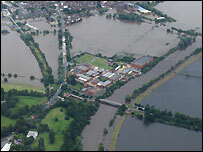 Tewkesbury was one of the worst-hit areas during the summer floods. Hundreds of homes and businesses were damaged after the Rivers Severn and Avon burst their banks in July. In August, thousands of residents staged a march through Tewkesbury in protest at any plans to build on flood plains.